John Cyrus, supporters player of the year last season, has signed with Frickley Athletic again. Four more of last season’s squad have put pen to paper for the coming campaign with Frickley Athletic. Blues manager Karl Rose has also signed three new players as preparations for the upcoming campaign in the Evo-Stik Premier League are taking shape. Central defender John Cyrus, goalkeeper Sam Leigh, left-back James Kay and midfielder Brad Riley have all signed non-contract forms as have new signings Louis Penty, Chris Wood and Jake White. White is a 25-year-old midfielder who coaches the Frickley Academy under 19s side and has played briefly for the Blues before. 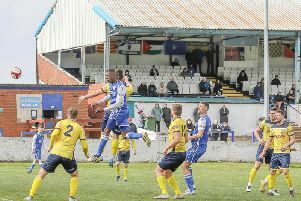 Another player who has also previously played for the Blues is 30-year-old striker Wood who was with the club during the 2013-14 season before joining Ossett Town last season. The third signing is 19-year-old midfielder Louis Penty, who has joined from FC Halifax Town. Frickley, meanwhile, are looking for teams to take part in the next Frickley Athletic Golf Day, which will take place at Hickleton Golf Club on September 3. The day will start at 11.45am with bacon sandwiches and tea or coffee followed by 18 holes of golf. There will then be a three-course meal. Cost is £40 a person with teams consisting of four players. Also, the club is looking for hole sponsors. These cost £10 each. For more details on entering or sponsorship, contact Pete Bywater on 07831 778290.